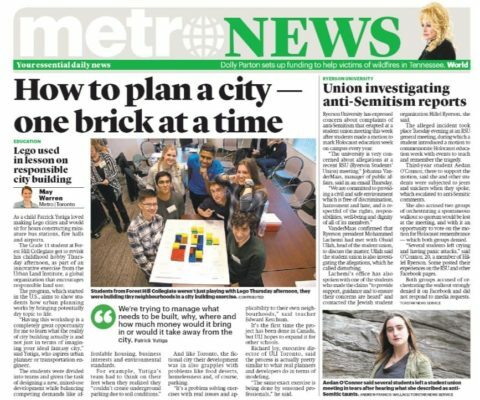 The mission of UrbanPlan is to generate more positive and informed dialogue about land use at the local level through the education of students – our future voters, neighbours, public officials, and land use professionals. UrbanPlan is a project-based learning curriculum development for high school classes focused on disciplines in business, city planning, real estate, architecture or law. During the project, students develop a financial proforma and physical model of their plan for an urban infill, mixed-use redevelopment project, and present their proposal to a mock City Council that awards the development contract to the winning team. UrbanPlan is supported by volunteers who are professionals in all disciplines of land use and development, selected for their depth of experience and knowledge. Through UrbanPlan’s 15-hour classroom curriculum, students learn the essence of development: how the forces of our market economy clash and collaborate with the non-market forces of our representative democracy to create the built environment – providing the foundation required for any informed land use discussion. Over the course of the exercise, ULI members who are local land use professionals interact with the students on a regular basis. As “facilitators” in the classroom, they challenge the students to think more critically about the UrbanPlan issues and the specific responsibilities of the students assigned roles as finance directors, marketing directors, city liaisons, neighbourhood liaisons, and site planners. ULI members also serve on a “City Council” to judge the teams’ proposals. Through the process, students discover the dynamic fundamental challenges of development: how market forces clash and collaborate with non-market forces to create the built environment. Through these roles, students develop a deeper understanding of the various stakeholders in the development process and the challenge of reconciling their often-competing agendas to create a well designed, market responsive, financeable, and buildable project. Volunteers accepted into the program are invited to a 1-day training session for hands-on experience with the program and tools. Trained volunteers serve in the classroom as Facilitators and as members of a mock City Council for final student presentations. The role with the greatest impact, most responsibility, and least time commitment is the role of Facilitator. Facilitators challenge the students to think more critically about the UrbanPlan issues and the specific responsibilities of their respective roles. Facilitators draw deeply on professional experience and are rewarded by creating excitement and inspiration in students for the urban development process. Students present their final proposals to a five-person mock City Council comprised of volunteers. By challenging the students’ work as if in an actual City Council meeting, the volunteers assess whether the proposals are responsive to the RFP, grounded in the facts of the UrbanPlan case, and consistent with reality. The City Council then awards the contract to the winning team. Thank you for your interest in UrbanPlan—we hope you will consider joining us! Sponsors of UrbanPlan benefit from financially supporting a meaningful, high-impact program that serves youth and emerging professionals.